Easter is coming up and we are even going to our first Egg Hunt this weekend. It's a tradition that we started when Kenzie was born and hope to continue as long as the kids want! I do wish that Mason will smile when he sees the Easter Bunny this year. 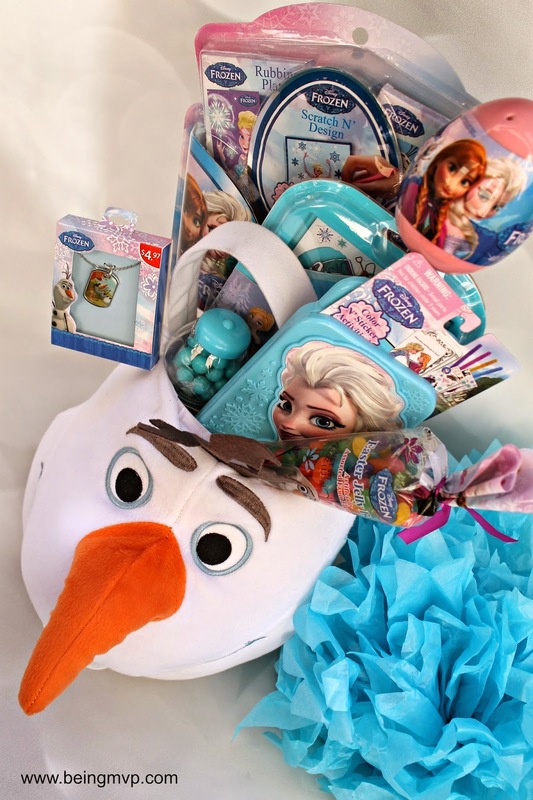 It's also time to start preparing fun Easter baskets for the kids this year and since FROZEN is still going strong in our household, it was the perfect theme to surprise Kenzie with. I headed to Walmart to pick up the FROZEN Easter basket goodies. 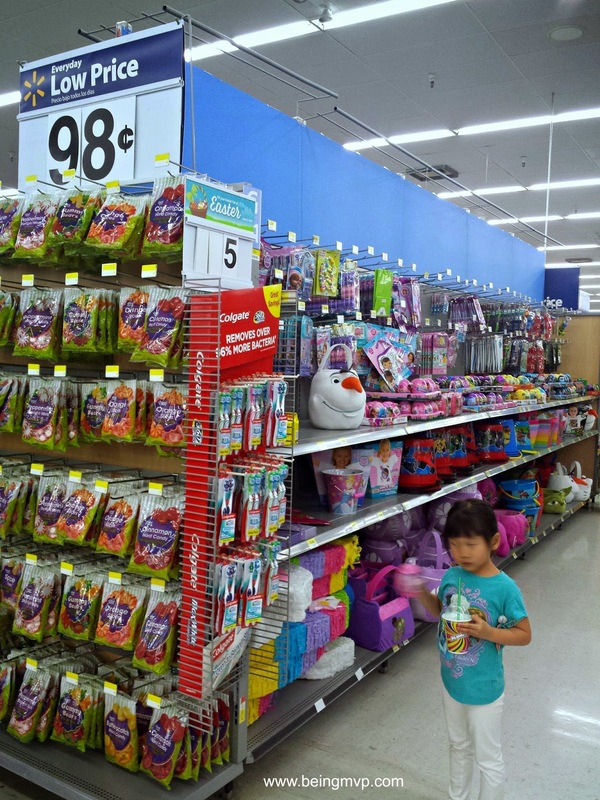 I shooed the kids to the toy section so that I could check out the Easter aisle (Kenzie surprised me by running through the aisle and grabbing an egg!). The selection was great and so reasonably priced so I picked up a fun huge Olaf basket along with Elsa and Anna toys and a few candies. 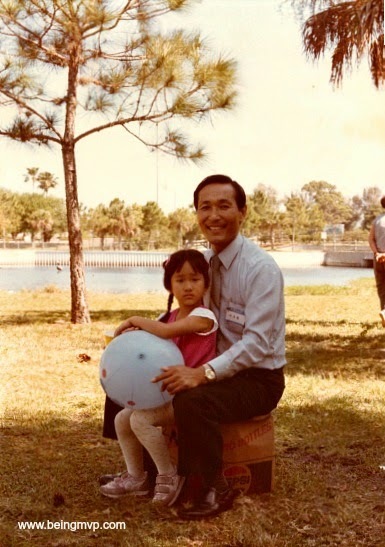 I really have only a few memories of my father who passed away when I was six years old. One that stands out is going on Easter Egg hunts at a park after church. It was really fun and I used to get those huge baskets full of mainly candy and chocolate bunnies as well as the neat punch ball balloons. Kenzie is going to turn 6 this Christmas and I can't imagine her not having a father at that age to grow up with. I want to create as many fantastic memories for her as I can as she grows up. The FROZEN assortment that I included in the Olaf basket include several small activity items (these are perfect for on-the-go and travel), an Olaf necklace, FROZEN jelly beans, FROZEN tattoos and a mini gumball machine filled with the perfect shade of blue. I can't wait for the Easter Bunny to surprise Kenzie with this basket of goodies. She's even more into FROZEN now that she saw the FROZEN Fever short right before watching Cinderella! I'll have to whip up an equally amazing basket for Mason - I'm thinking Marvel themed because he seems to think he is a super hero at times. Our tradition of going to Easter Egg hunts, taking photos with the Easter Bunny and preparing amazing Easter baskets will hopefully create wonderful memories for the kids to cherish as they grow older. What are your Easter traditions? Have you thought about creating a Disney themed basket? How cute is that? We love Olaf in our house. Oh I love it. We rarely do candy for Easter and love doing fun 'kits' like this. Thanks so much for sharing. My girls love Frozen. 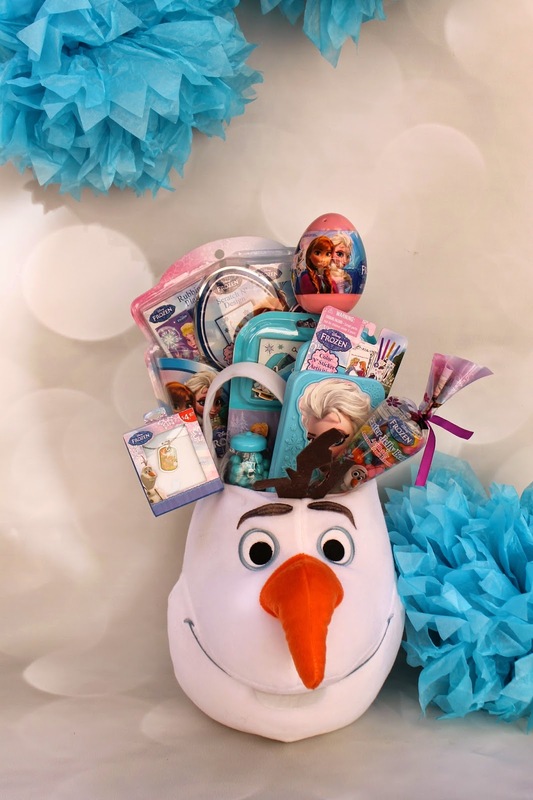 Frozen is still all the rage lately, so this is the perfect the Easter basket. The Olaf basket is the cutest! Olaf! That's seriously the cutest basket I've ever seen. I love it! So many cute items for the Easter basket! Which reminds me I need to go shopping for Easter..
That is absolutely the cutest basket I've ever seen. On its own the basket is great, because, well, Olaf. All of the little gifts inside make it super incredible though. I've GOT to do this for my daughter. She's a Frozen fiend, and Olaf is her favorite character. Thank you so much for sharing this. Olaf is so cute! I love this basket idea! My kids have their own special baskets, but a good theme one is perfect to bring along on an egg hunt! What a Frozen basket! We always go through baskets right away in the morning, of course a small piece or two of candy before breakfast. If it hasn't rained or snowed, we do an outdoor egg hunt in the yard for the kids. Our Easter tradition is to always try to be really creative with our baskets and buy something my boys will use again. They love Frozen but everything seems pretty girly usually, but Olaf would be perfect! My girls are Frozen crazy, luckily there's lots of things out there right now to make a basket. i need to find that Olaf one - too cute! I love that basket, it is unique and oh so adorable. What a cool idea. My kids totally would have been into a Disney themed Easter basket. They were really into Mulan though! I love themed Easter basket!! 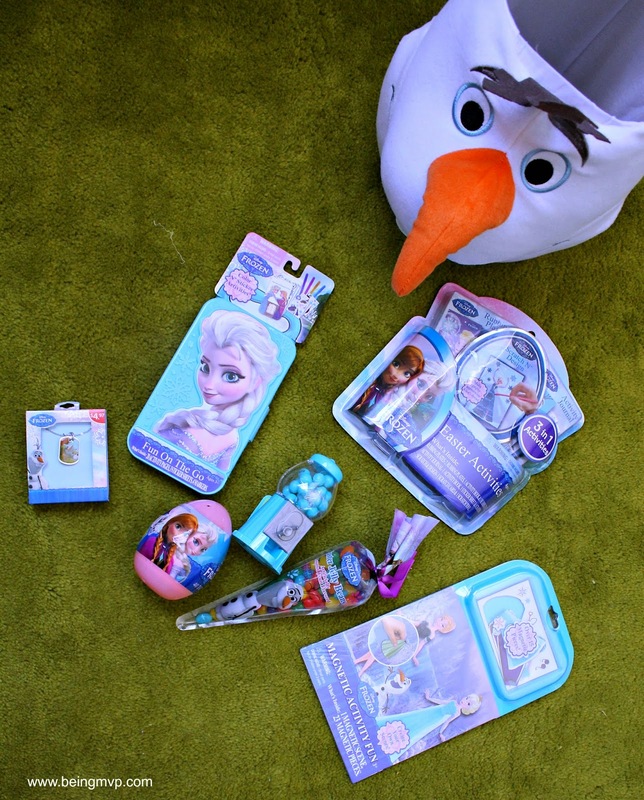 Those are cute Easter basket fillings for Frozen and I love the Olaf basket! What a fun Easter basket idea. I LOVE it. I think my kids would enjoy something like this too! Amazing Easter Basket!!!! I need to make a list of what to put in ours! That is such a great Easter basket! My kids would REALLY love it! So cute! My son would die over that Olaf! Those are some great items in that basket! My grandsons would love the Frozen stuff!